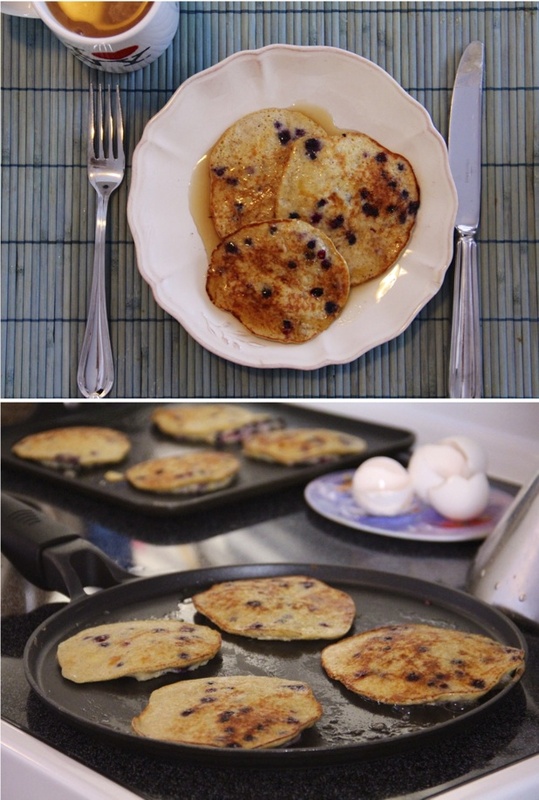 These pancakes are so delicious and so easy to whip up that we even make them on weekday mornings! And that's saying a lot… because getting two adults + one very active toddler ready and out the door in time in the morning is no simple feat. I love how healthy this recipe is. I love how they magically develop into real pancake consistency even though they contain no flour, no baking powder and no sugar. And I love how my toddler (and husband) devours them. In a large bowl, mix the mashed bananas, eggs, coconut and cinnamon. Then gently toss in the blueberries. Heat a nonstick frying pan over medium-high heat. Let the pan get really hot, then add some oil or butter and swirl to coat the the pan. Add about 1/4 cup of batter per pancake - very gently flip the pancakes over once the sides are drying and bubbles form on the surface - about 2-3 minutes. Cook the other side another 2 minutes - until golden. what?? I was sure this would require a flour substitute (which I never have around) but glad to see it doesnt! definitely need to go pick up some bananas so i can make these on sunday.